Welcome by again today, everyone! 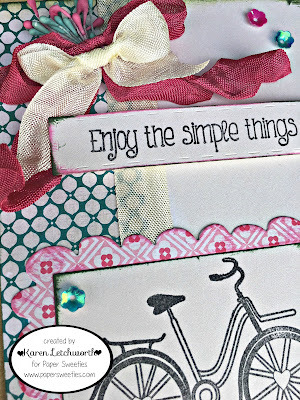 Thanks for stopping in to take a peek at this sweet card I created for Paper Sweeties using some more of my favorites. There are so many amazing stamp sets, sweet cuts and goodies; and we just know you will LOVE these wonderful products. Here's what I created for today's post. I used some cream card stock and patterned papers to create my base, and I ran a length of Frosting Seam Binding along the seam of the two papers on my card, and used the Frosting Seam Binding with a piece of Strawberry Seam Binding to create a bow. Next, I cut the largest size in the Rectangle Scalloped Frames Sweet Cuts and I stamped the adorable bicycle from the Hugs & Kisses Stamp Set. 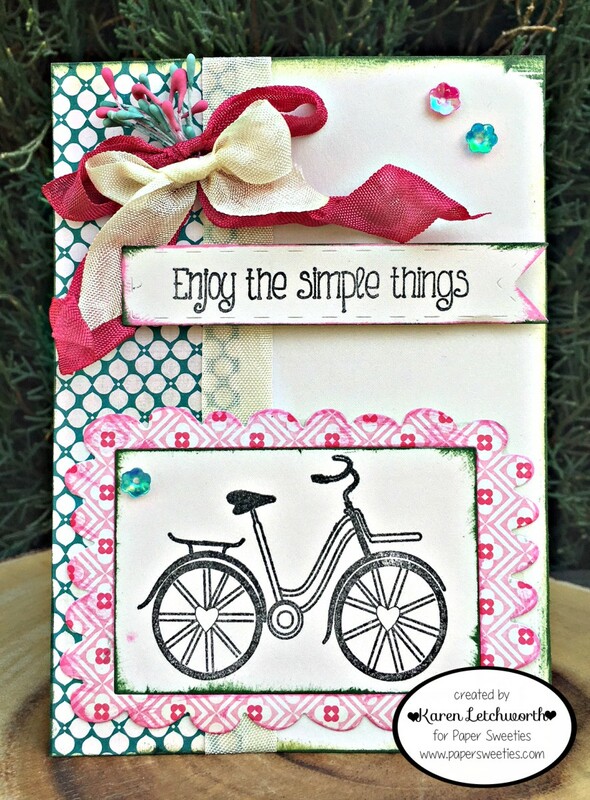 I also added a sentiment that is found in the Hugs & Kisses Stamp Set. To make it stand out nicely, it is stamped onto the banner found in the Sweet Borders Sweet Cuts; which is another set I use a lot. It's awesome! The finishing touches were some Green Apple Sequins and Pink Grapefruit Sequins. These sweet little cup-shaped sequins are adorable, unique, and add SO much sparkle and fun to your cards. Here are the names and links to all the blogs of my talented team-mates at Paper Sweeties. each of these talented ladies have prepared a special project to inspire you today. i hope you will stop by to say hello, and then head over to Paper Sweeties for some shopping fun! 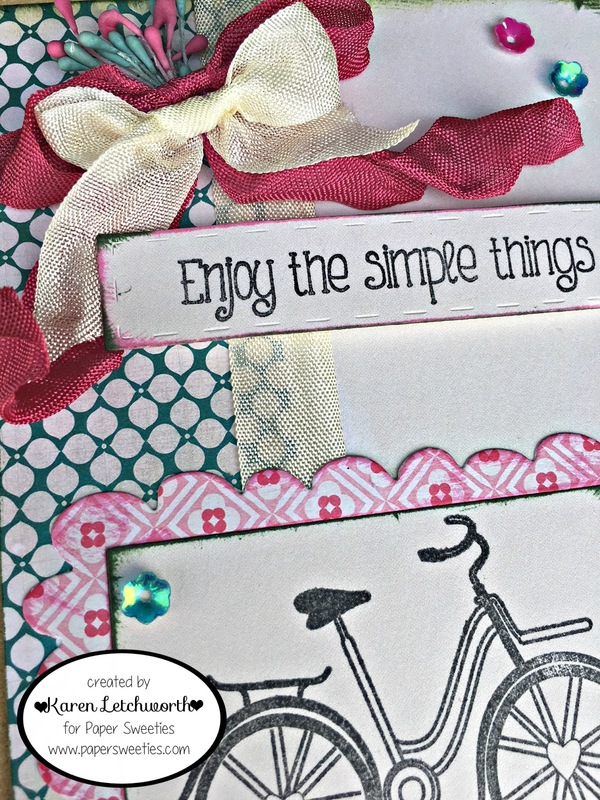 Simon Says Stamp Wednesday Challenge Blog - Add A Die Cut - I used Paper Sweeties Sweet Borders Sweet Cuts (dies) to cut my sentiment banner, and used Paper Sweeties Scalloped Frames die-cut around my bicycle as well. Very pretty color choices and love the layout. So pretty. 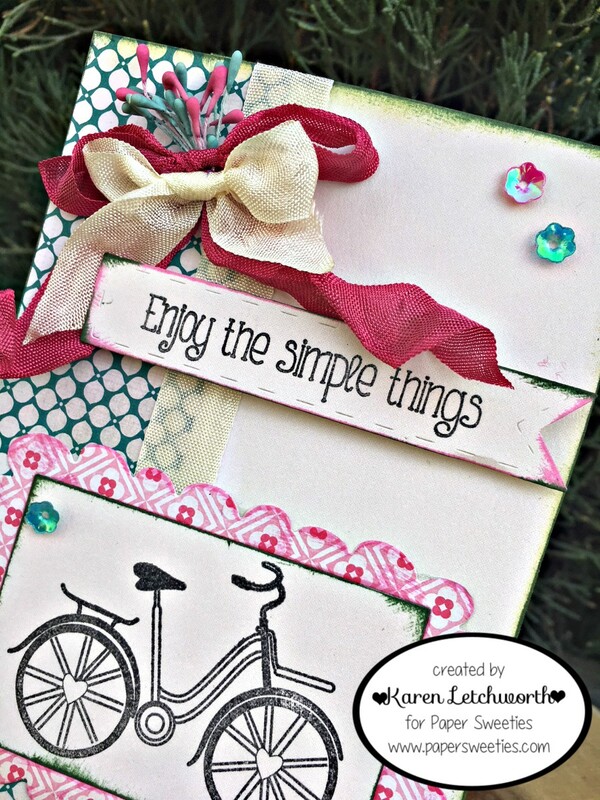 Beautifully designed & love the seam bindings, Karen! There's that adorable bicycle stamp again. I love this. Always so nice to see your sweet cards. Thanks for your comments. They mean so much to me. Karen Letchworth - That's ME! !